A nine-year-old girl at the centre of a life support battle in Texas has “passed naturally”, her parents say. Payton Summons, said by doctors to be brain dead, had been on life support following a heart attack in September. Doctors had wanted to remove her from her ventilator but her parents obtained a court order forcing the Fort Worth hospital to keep her alive. Under Texas law, a person is considered dead when they have lost all brain function. 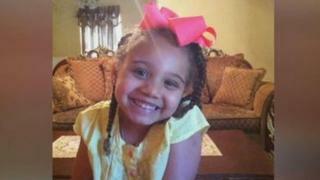 Payton’s parents’ lawyer, Justin Moore, said she had not been taken off life support. How did Payton fall ill? She was staying with her grandmother when she woke up and said that she could not breathe. She was taken to Cook Children’s Medical Center, where doctors said in a statement she had “suffered a devastating injury to her brain due to being without oxygen for over an hour”. This was caused by a tumour in her chest that had stopped her blood circulation. The doctors said they were able to revive her heartbeat but not her breathing. She was placed on a ventilator before doctors confirmed that she did not have brain activity. Payton’s parents filed a temporary restraining order to keep her on life support while they tried to find another hospital that would accept her. However, only two out of more than 20 institutions contacted said they might take her – “and those were preconditioned on certain things which may be life threatening to Payton if performed”, another lawyer for the family, Paul Stafford, told CNN.